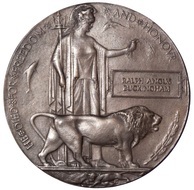 The photographs above give us an insight into Ralph Buckingham who is commemorated here. 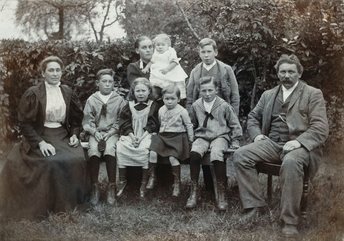 On the top left is the Buckingham family and top right is the St Remigius Choir in 1909 of which Ralph was a member. RALPH was drowned at sea on June 5th, 1916, aged 21, His name is on the Naval Memorial at Portsmouth. He was born on 12th February 1895, the fifth son of Agnes Mary (nee Shrimplin) and the late Frederick Thomas Buckingham. 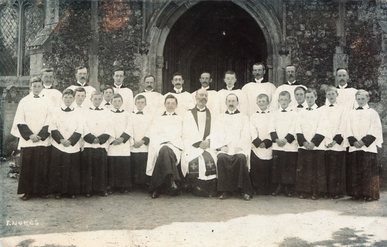 As a boy he was in the church choir and was the first to join the Hethersett Troop of Boy Scouts, but at an early age he determined to enter the Navy, though his first attempt to gain admission met with failure. In order to pass a medical test a serious operation was necessary. We do not have information as to just what this operation was. It is said, however, that it did not alter his purpose and he walked into the operating room singing. 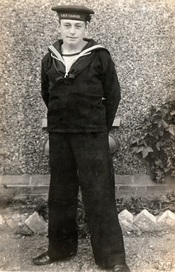 Ralph joined the Navy, aged 18, on 12th February, 1913 for a 12 year engagement. Three scars on his right leg and one on his left are recorded and these may have been related to the operation. 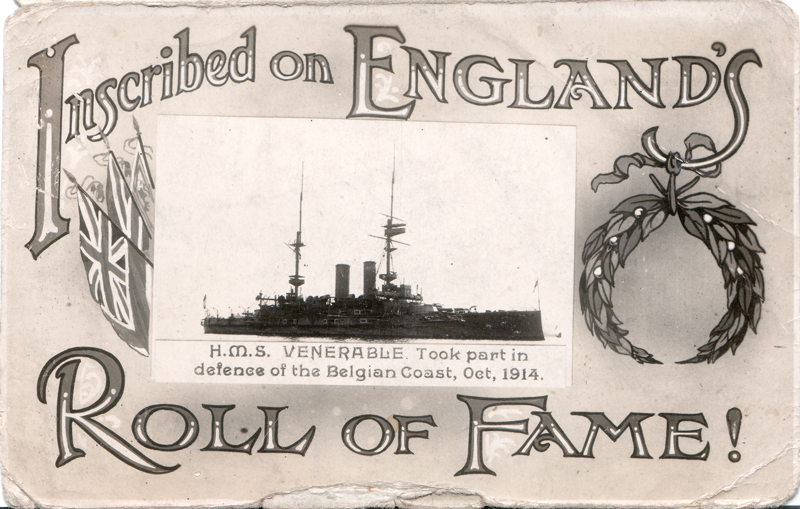 After serving on several vessels and a course of torpedo instruction, he joined the crew of HMS Hampshire as an Able Seaman on 25th June, 1915. In the great naval victory off Jutland on May 31st, 1916, the Hampshire played her part, ramming one enemy submarine and sinking another by gunfire. She seems to have come out of the battle unscathed, much to Ralph's relief as he wrote in a letter to his mother which was, sadly, to be his last. Mrs F. T. Buckingham has received official information that her son Ralph, who was a 1st Class A.B, went down in HMS Hampshire. 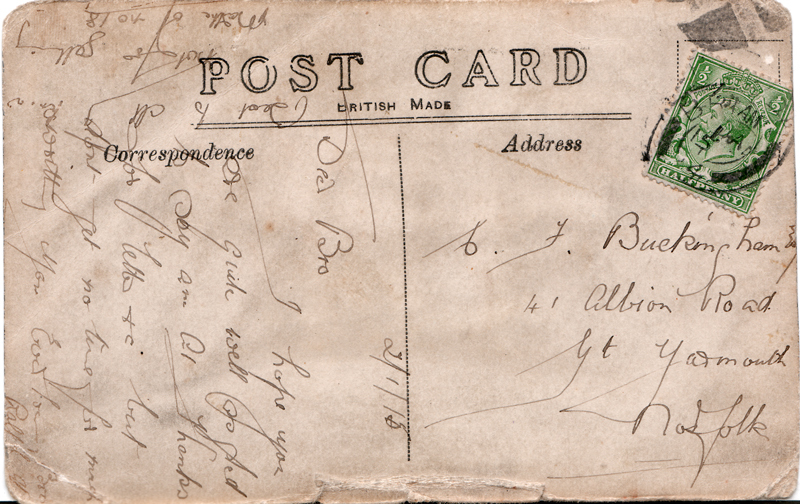 He joined the navy at the age of 18.It is of particular interest that after the news of the disaster to the Hampshire was published, his mother received a letter from him in which he spoke of having come safely through the recent naval battle. Ralph's late father was a well sinker, wood pump maker, plumber and house painter. When their father died, Ralph's elder brother, Frederick Herbert, took on this business and Walter, the eldest son, took charge of the ironmongers' shop and post office which is now the Macmillan Charity shop in the village. Lewis the 4th son married Nurse Moore. Their son Lewis Alan Martin is still alive in Sydney, Australia and well into his 90s. On the left is a commemorative bronze plaque issued in Ralph's memory. 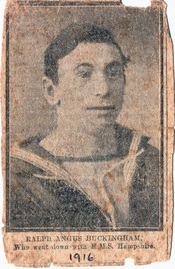 In the middle is a newspaper cutting from the Hampshire News and on the right Ralph in his HMS Ganges uniform. He had an operation before he joined the Royal Navy, and he was in Norwich hospital. He's always told me, that when he came out of the anaesthetic, he was singing hymns, because there'd been a church service the day before. He had a very good voice and everybody in the ward was saying how very nice he sounded. I hope you are quite well as glad to say am I. Thanks for letter and c (?) but don't get no time for much writing.